Allergies have become an enormous health issue in the United States. There are many theories on why so many people are becoming allergic to substances previously tolerated by much of the population. But the fact remains that allergies are a serious public health issue. What can a natural health enthusiast do to prevent allergic reactions? There are many defensive actions one can take to avoid situations in which allergic reactions become a problem. In this article we focus on ten tried and true techniques for limiting exposure and mitigating negative outcomes. 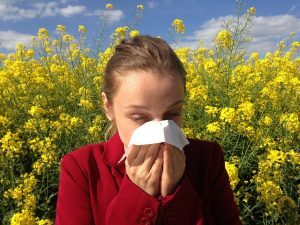 Quick Facts About Allergies in the U.S. If you suffer from allergies you need to become an active manager of the substances and situations you encounter and you need to develop an ALLERGY MANAGEMENT PLAN. Here are some precautionary tactics every allergy sufferer should consider in a strategy of how to avoid and prevent allergic reactions. Regularly monitor your ambient home environment with a humidity gauge and mold test kit available at big box stores. Keep humidity level at or below 50%. Avoid mold and mildew in the home by keeping humidity low, rejecting indoor plants grown in soil, and storing firewood outside. Keep the air in your home free of particulates by closing windows, using aircon and vacuums with HEPA filters, putting cheesecloth over HVAC vents and choosing hardwood or tile floors when possible. Pets are wonderful friends but dander can be debilitating. Try to keep only outdoor pets and regularly shampoo any pets you must keep indoors. If you are allergic to cats there is basically no method of allergic deterrence other than avoiding them altogether. Dust mites are a menace both indoors and out. You know what they say about cleanliness, well, it applies doubly to anyone allergic to dust mites. Keep the indoor dust level low at all times, encase your sleeping mattress in a mite-proof cover and wash linens weekly. When outside play defense by avoiding hot, dry, windy days when pollen is high, especially before 10AM; protect yourself from insect stings with long pants and sleeves; consider wearing a painters mask; and avoid raking leaves or mowing grass if possible. When traveling stay only in non-smoking rooms, avoid feather pillows, keep car windows closed, and only order restaurant dishes you know or can confirm are safe for your condition. Plan ahead by keeping a diary with entries about your activities prior to any allergic reaction. This will help you discover and confirm triggers that can be avoided in the future and can help your doctor with a diagnoses if you feel the need to seek medical advice. If you are subject to severe allergic reactions to any known substances wear a medical necklace or bracelet so caregivers can be aware of your condition if you suffer an attack and are unable to communicate. Take the time to write down an action plan in case you suffer a severe allergic reaction. Keep the plan in a handy place where everyone in your family has easy access. It is crucial to react quickly in times of reactive stress so be prepared with a list of known allergens and a plan of action in case of an event. In addition to many natural remedies that address certain allergic reactions after the fact, one should also take defensive action to prevent allergic reactions before onset. Of course, one can always resort to allopathic medicine for pharmaceutical relief to the symptoms of some allergic reactions. But this only provides a degree of palliative masking of the symptoms and usually does nothing to address the source of the problem. You would be wise to consider taking action with an allergy management plan before the fact and trying some homemade allergy medicine known to provide relief before going down the path of expensive and often addictive pharmaceuticals.